Measures are used in every aspect of our lives and are the multi-purpose tools of mathematics. Your metre stick can be used for measuring, weighing (as a balancing beam) and a shadow stick (for telling the time). The start of the tape is marked with a large knot tied into the string. Each metre is marked with a knot and the half-metres can be marked with a pen. 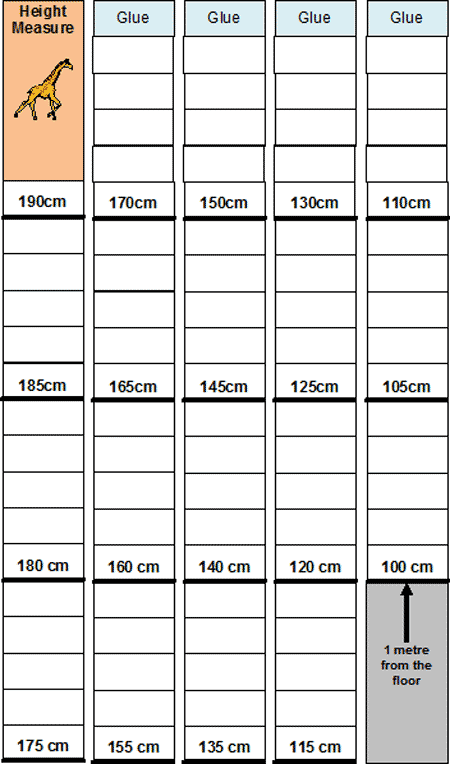 You now have a measuring tape of 6 metres which will be useful for the measuring activities in this Unit. Measure your height against a wall. Measure the height of a few of your friends. You and your friends can make a ‘body’ from newspaper, and record names and heights on the ‘body’. You can get good practise in measuring small items by comparing the sizes of the different printed letters in a variety of books. Question: Find out how printed letters vary in size - height, width, etc. 1. As the size of letters vary from each other, it would be difficult to measure each letter individually. You will have to discover a way of measuring so as to compare letters in one book with those in another book. 2. Find a suitable measuring method using a set length and counting the letters or by counting the letters and measuring the distance. 3. 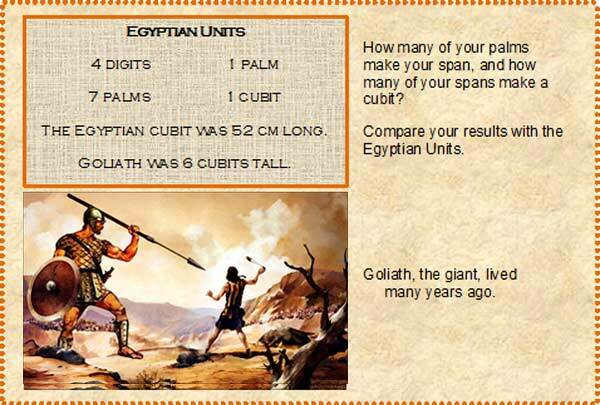 You can also measure the height of letters and find how many lines of print fit into a given depth of page. •	Mass is the amount of matter in an object. •	Weight is the measure of the force which the Earth exerts on that object. The weight of a body will change depending on how far it is from the Earth's surface. Astronauts demonstrate this when they show weightlessness in space (but they still have the same mass). Pan balance: Make your pans to hold the weights and the objects you wish to weigh by placing two small boxes, or plastic containers, on either end of your balance, using bent paper clips for hooks. By moving these either way along the beam, a good balance can be made. 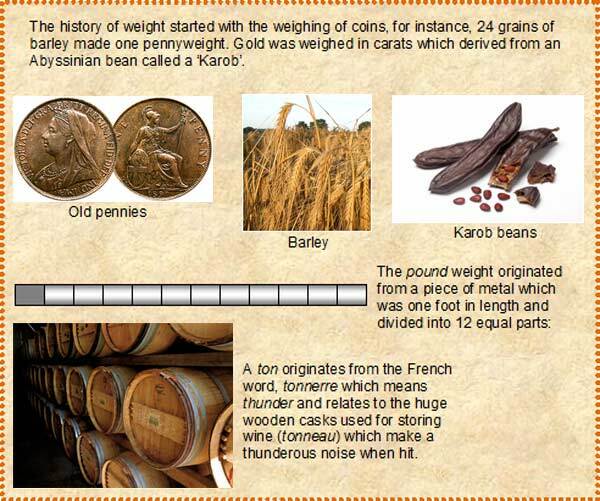 Make your own kilogram and half and quarter kilogram weights. You will need a 100 g and a 10g weights for some of the activities which follow. You may need to borrow a standard weight to make your own weights. See Saw balance: Probably you have played on a see-saw in a park. 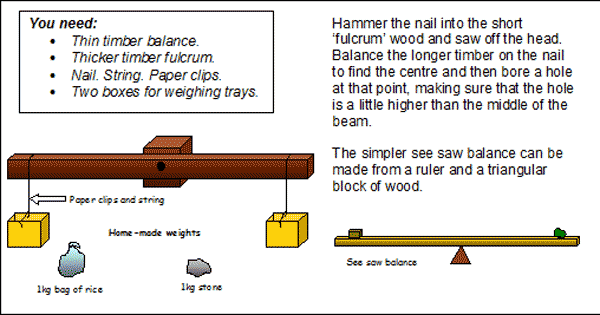 Your own smaller see-saw can be made by using a ruler and pencil like in the diagram above. Then confirm the order of weight by comparing the stones on your balance. This is a challenge – find out how to do this!! Were your estimations good? 1. What is approximately ten times the weight of a baby? 2. What is one hundredth of the weight of a large man? 3. How heavy is a rhino in small stones? 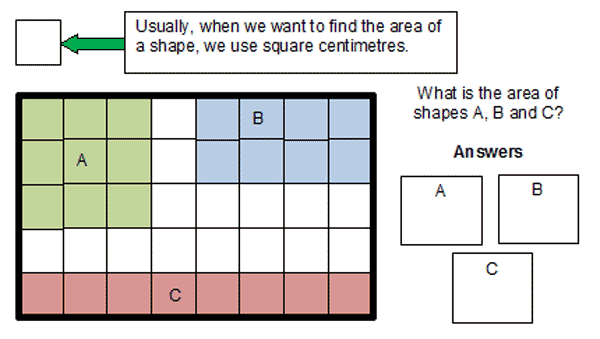 Area is the measurement of surface. 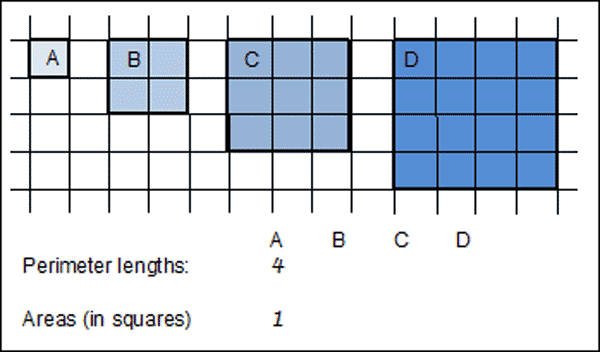 To measure the area of a surface, one has to find the number of unit squares within its boundaries. Fold a circle into 16 segments and cut them out. Stick the segments together as shown. The segments make a rough rectangle which is p x r long (i.e. half the circumference) and r wide. The area of the rectangle made from the circle is therefore pr2.